The twinkly cake table skirt is perfect for adding an additional element of decoration to the wedding cake. 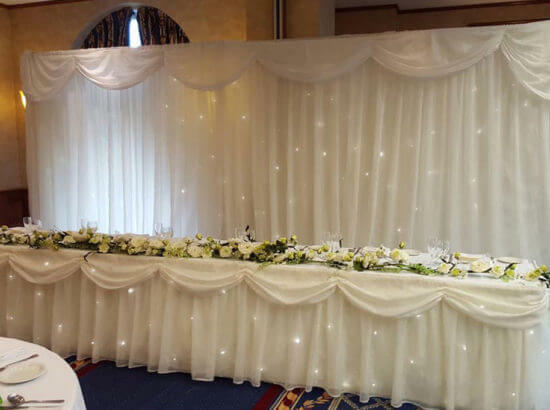 Our ivory starcloth cake table skirt is made by the same manufacturer as the starlight backdrop and top table skirt and so they work together perfectly. Its simple design allows us to clip the cloth onto the table at your venue with little difficulty, and it is battery operated and doesn’t have any trailing wires so it can be moved to a location of your choice with ease. The cake table cloth is designed for a 3ft round cake table but as you can see from the images will work with a 4ft trestle table. Premier will also provide you with a controller to set the brightness and twinkling speed of each star in the fabric, so that your wedding cake table is adorned with the beautiful decoration it deserves. In addition, the ivory starcloth cake table skirt is made from a fire retardant material for your safety and peace of mind. To find out more about our ivory starcloth cake table skirt, or to book one for your wedding reception, get in touch with our friendly team. We look forward to hearing from you.